Texans love their food, right? We love barbecue chicken, juicy steaks, and big burgers. Speaking of burgers, have you had one recently? Summer came to an end and with fall in full swing, if it’s been a few weeks or a month since your last bite of juicy meat and fresh toppings, we won’t blame you. But now it’s time to get back to it. At 4 Way Bar and Grill, we know how to make an indulgent burger that will satisfy any craving. So you know what you have to do. This weekend, or even tonight, come down to our restaurant in Lakehills and experience a burger like no other. Want some tips to make your own in the meantime? Here’s everything you need to know to make a restaurant-quality burger. A majority of home cooks’ first course of action when making burgers is to head to the grocery store to pick up a package of beef. However, since the beef is the main and most important ingredient, it’s important to not settle for inferior meat. Head to the butcher department and pick out a hefty piece of beef that can be taken home and ground yourself. There are various methods of doing this, but the least expensive and simple method is to use a food processor. Cut the beef into small chunks and put them in the freezer until chilled, but not frozen. Then give the chunks a few pulses in the food processor. If you’re feeding a hungry family and want to skip this process, choose a package of meat that is at least 20 percent fat. Or better yet, come to our restaurant and we’ll take great care of you. When forming the meat patties, it’s important to handle it has little as possible. The warmth of your hands will transfer to the meat, which will warm up the fat. When making restaurant-quality burgers, fat in the meat is like salt on potato chips — you just have to have it. Warm fat means that it will be left on your hands and on work surfaces instead of in the meat. So keep everything cold. It’s tempting to add salt and other seasonings to the beef as soon as you open the package or straight out of the food processor. But don’t do it. 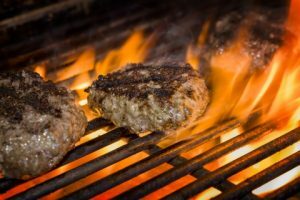 Salt will dissolve proteins and draw out moisture from the meat which leaves your burger tasting chewy, with a sausage-like texture — which is anything but restaurant-quality. Add kosher salt and fresh ground pepper a few minutes before the patties hit the heat. 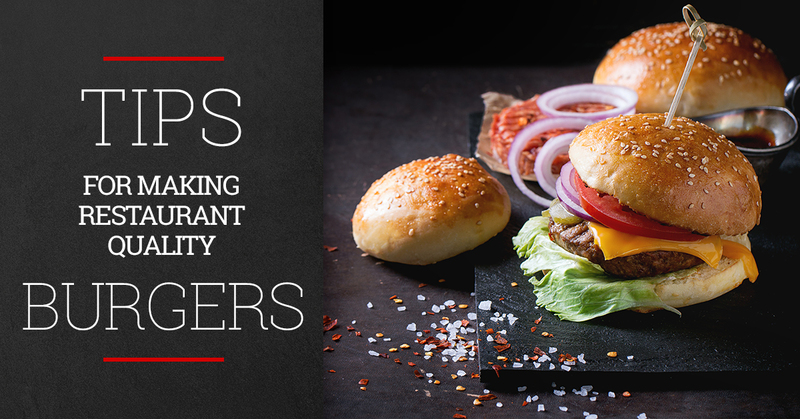 If you’re cooking for several people, you want to make sure that each burger will cook evenly. To make this happen, use a scale to weigh each pattie. It does take some extra time, but work quickly to keep the beef cold and it will make a difference in the quality of the burger. Many of you may already know this trick, but to prevent a rounded pattie, press down the center of the pattie to create a dimple. This will prevent any bulging burgers and will keep toppings in place. For a more even internal cooking of the beef, flip the patties every 15 seconds or so. It might be a habit to just flip once, but in the end, you save time at the grill and ensure each patty is cooked thoroughly. To make sure the beef is cooked to order, use a thermometer. For a truly amazing, restaurant-quality burger, you can’t forget about the bun. You want a bread that isn’t too small and you’re left wondering if you ordered a bunless burger, but you also don’t want a bun that is too thick, leaving you with mouthfuls of bread. 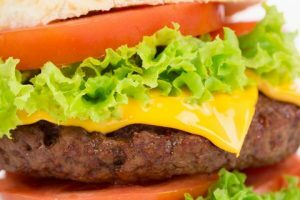 You can be confident that 4 Way Bar and Grill has found the best bun for our burgers. Who are we to say what you put on your burger? Customize your meal to your heart’s content. However, our restaurant chefs do recommend onion, a healthy dose of mayo, two slices of cheese, lettuce, and tomato. You can’t go wrong with this classic combination of toppings. The juice of the burger, the crunch of the lettuce, the coolness of the tomato, the smooth, rich flavor of the mayo, and melty cheese — is your mouth salivating too? For a burger that can’t be found anywhere else in Lakehills, come visit our restaurant tonight. We’ll serve up tasty burgers, delicious sides, tangy margaritas, and you’ll feel like you’re at home in no time. Without the mess in the kitchen.